"I just wanna make sure that my songs have made it to the karaoke versions of some of the parties here. I would be sad if they weren't there," said Jim Brickman about his collaboration with Pinoy music talents. He will be performing live tonight, 8 p.m., at the Eastwood Mall in Quezon City. Grammy-nominated music artist Jim Brickman hopes to work with Asia's Songbird Regine Velasquez on his future recordings. "As many as those Filipino talents that I worked with, I've never done a song with Regine [Velasquez] before. I think that would be nice because of her voice. She sang some of my songs before, but not ever met before," the American songwriter-pianist said during the media junket prepared for him yesterday, October 27, at the Eastwood Mall in Quezon City. The music artist from Cleveland, Ohio, has been in the country a couple of times already. And with every visit, he was able to work with local music artists—like Megastar Sharon Cuneta, Concert King Martin Nievera, Lea Salonga, Ariel Rivera, and Erik Santos. "Everybody in the Philippines can sing," said Jim about his collaboration with several Pinoy music artists. "Like when I checked in to the hotel, the hotel [staff] starts to sing. They just start singing but it sounds beautiful. It's not just ho-hum singing like some of my friends who can't sing. It's really good singing. I think it's something in the water, everybody has the talent. Everybody has a beautiful aura. If they can't sing, they may be an artist of a different form. It's such a romantic quality to the culture here, so I've always been attracted to doing duets with the Filipino talents. "You know, it's just something that comes alive. In fact, even this morning when I was on a TV show at ABS-CBN, we never rehearsed. We did 'My Valentine' with the host there, I never met her and I just started playing and she just started singing like we rehearsed 20 times or something. It's just amazing! I hope that there will be a lot more great partnerships with Filipino talent." Does he choose the artist he works with in a project? "I think that the duet partners have to have a reason for being, they can't just be picked up from a list," he replied. "They have to have a friendship with them or a relationship with them. So, I only like to work with people that I already discover, who are new, or people who I am already a fan of, who I admire, and will want to work with. It's never like a casting from a list, there has to be a purpose." Aside from working with Filipino talents, Jim also dedicated the song "Noche Pacifica," which is included in his newest album Beautiful World, to the Philippines. He related to the media, "As many of you know, I've had so many concert tours in the Philippines. I've had the chance to go to anywhere from Cebu, to Boracay, to Palawan, to Davao. When I was on the Jim Brickman Cruise, a yearly cruise, almost all the entire staff on the cruise, they were a lot of Filipinos on the cruise with me. We got to talking every night, you know, about when I'm coming back to Manila. "You know, I just snap away to the piano on the ship and started thinking about the travels all over the world. How beautiful it was in some of the beaches here in the Philippines. And I thought, the one thing that got into mind was that I was doing a dedication to the countries all over the world. The idea of peaceful night has such an effect on me, from Cebu and from Boracay included. So I wrote it on the cruise, thinking about writing that song as my dedication to my friends here." 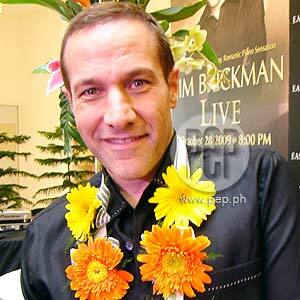 Watch Jim Brickman perform live tonight, 8 p.m., at the Eastwood Mall Open Park in Libis, Quezon City. He will be joined by local pop icon Christian Baustista, who collaborated with him in the song "Never Far Away," which is also included in Jim's Beautiful World album.